Mr Sanjay Sood, Mr TS Walia, Mr Sudesh Kumar Poddar, Mr Garish Oberoi,Mr. Dilip C Datwani, SK Jaiswal, S M Shervani. New Delhi, April 11, 2017 – TheFederation of Hotel & Restaurant Associations of India (FHRAI) is exploring legal remedies with regards to the recent Supreme Court Order,shutting down from 1st April 2017, the sale of liquor at establishments which fall within 500 metres range of State and National Highways. 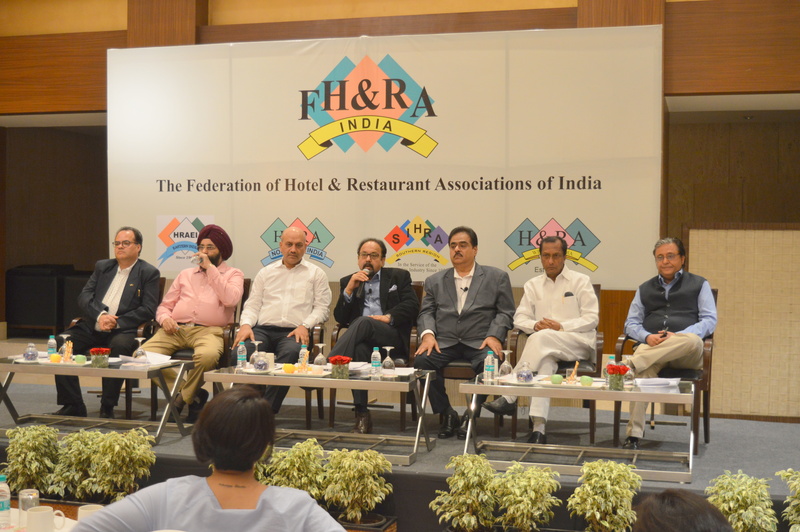 FHRAI is India’s apex body and The World’s Third Largest Hotel & Restaurant Association. Speaking at the occasion Mr. Dilip C Datwani, FHRAI said “Rs.2,00,000 crores loss to the exchequer and closure of more than 1 lakh establishments is not a small thing. We would not have minded being sacrificed if the ban were to yield results. But reality is that all the job losses and other damages would be wasted. The object sought would not be achieved”. “Total consolidated loss to both States and to the industry will be around 2 lakh 20,000 crores. The entitre MICE industry including weddings, corporate events will be negatively affected” said Mr Garish Oberoi, FHRAI. “There has been an unprcendented blanket ban on all national highways across the country without seeing the practical aspect of the topography & terrain of the cities, in the process having affected hotels & restaurants, who have invested crores of Rupees towards the development of the tourism industry in the country. For example, Darjeeling, which falls on NH 55, has hotels stretched over 77 kms from the very base of the town of Siliguri that are directly affected” further continued Mr TS Walia, FHRAI. ‘The judgement has effected those establishments that operated legally and we are not takeaways and serve for consumption in premises only . Many entrepreneurs who have taken loans will be placed at a disadvantage .it will make their properties non preforming further ‘continued S M Shervani, FHRAI. “Most of the entrepreneurs who bid as part of Government PPP tourism projects along national & state main roads & highways had modelled their cash inflows on these experiences considering room conferencing, food, beverages revenues over their concession periods. But a lot of these establishments with significantly reduced business will result in distressed financial assets & may lead to a large scale NPA situation for our banking & financial system and may severely impact the investment climate in tourism & hospitality & overall business environment in India. It will also stall the Indian growth story for many years to come” continued Mr Sudesh Kumar Poddar, FHRAI. “We see a huge concern of liquor bootlegging & it’s emergent social evils of a blackmarket economy & a corruption driven parallel economy which the governments are trying so hard to battle & weed out of our system” further added Mr Sanjay Sood, FHRAI. Almost 9 million tourists visit India, resulting in almost 27 million foreign visitations across Indian states. These along with ~ 1.8 bn domestic visitations frequent a significant portion of these ‘establishments’ as guests. All of this will be put to risk if the overall food & beverage experiences are compromised at such legitimate establishments which pay direct & indirect taxes & levies to both the central & state governments. After decades of independence, India despite all its natural geographic & cultural heritage still has only 0.67% of the tourism market share which is now set to further reduce drastically. India’s Tourism, Travel & hospitality is estimated to contribute to ~ USD200 Billion, ~ 9.5% of Indian GDP, around 5crs employment, I.e. ~ 9% of Indian employment, ~ USD$ 30 billion+ investment at ~ 5.5% of total capital investment in India. This capital investment is immobile & cannot be relocated or picked up & moved driven by decisions which overnight challenge their business models on a retrospective basis. Next Post Jab Dil Boley Dominos @199 Only.